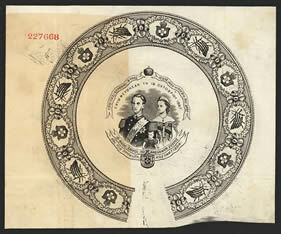 The design commemorates and celebrates both the wedding of King George I and Queen Olga of Greece, (on which see design 216450), and the birth of their first son, Prince Constantine, on 2 August 1868. The wording of the ribbon banners may be translated as 'On behalf of the Greek race', 'My strength is the people's love', 'May God protect the royal couple and Prince Constantine' and 'They married on the 18 October 1867'. The actual date of the marriage was 27 October 1867.